CHICAGO, IL--(Marketwire - Feb 14, 2012) - The national mortgage delinquency rate (the rate of borrowers 60 or more days past due) increased for only the second time since the end of 2009, edging upward to 6.01% at the end of the fourth quarter in 2011. This information is reported by TransUnion and is part of its ongoing series of quarterly analyses of credit-active U.S. consumers and how they are managing credit related to mortgages, credit cards and auto loans. Between the third and fourth quarters of 2011, all but 13 states experienced increases in their mortgage delinquency rates. 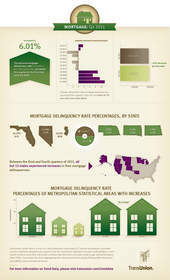 On a more granular level, 64% of metropolitan areas saw increases in their mortgage delinquency rates in Q4 2011. This is the same percentage as found in Q3 2011, but up from Q2 2011 when only 21% of MSAs experienced an increase. "To see that, quarter over quarter, fewer homeowners were able to make their mortgage payments is not welcome news," said Tim Martin, group vice president of U.S. Housing in TransUnion's financial services business unit. "However, it was not unexpected. First, there tends to be a natural seasonality, evident well before the recession, of higher delinquencies in the fourth quarter; perhaps explained by borrowers balancing holiday spending vs. debt payments. Secondly, on the economic front, house prices continued to deteriorate in the fourth quarter and unemployment remained stubbornly high. This combination leads to more negative equity in homes and reduced real personal income that can affect borrowers' ability and willingness to pay their mortgages. "The more encouraging news is that, when looking year over year, more homeowners are making their mortgage payments and the delinquency rate dropped over 6% since Q4 2010. While it is certainly good to see the rate dropping, at this pace it will take a very long time for mortgage delinquencies to get back to normal." Many see the economic environment beginning to brighten, although modestly. Therefore, TransUnion's forecast predicts mortgage borrower delinquency rates to drift downward marginally in 2012, but in the meantime we may still see a quarter or two of slightly elevated nonpayment rates as some consumers are not able to, or decide not to, repay their mortgage debt obligations in light of the uncertain economic outlook.